Kent Gallery is pleased to present our first invitational Desire which brings together six artists showing here for the first time. On display are multimedia installations, video work and paintngs. This show presentts a nueanced and subtle look at the representation of desire from unexpected acts of physical contact to latent yearnings of adolescence. Robert Arnold's video piece, Morphology of Desire, on view at Kent, has appeared at numerous festivals around the world, including the New York Exposition of Film and Video. The International Media Art Biennial in Korea and the Directors Fortnight in Cannes, France. 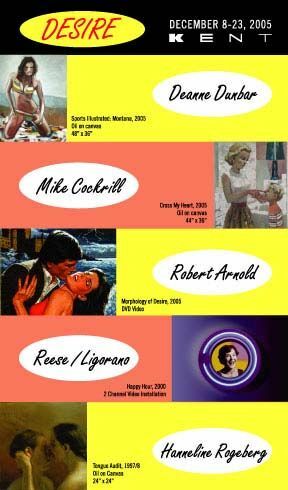 Methodology of Desire uses vintage Pulp Romance novel covers as its source material and a sophisticated computer program which randomly morphs the generic couples into a seemless cascades of images. Arnold's work is included in the collections of the DeCordova Museum, the Harvard Film Archive and the Australian Film Institute. Mike Cockrill had exhibited frequently since the 1980s. His early work was done in a cartoonish style and was shockingly sexual. Cockrill's current work expresses the formation of desire in a look more reminiscent of Rockwell and The Saturday Evening Post though Cockrill's undertones are much less wholesome. Cockrill had shown at Marella Arte Contemporanea, Milan, Italy and PS1. His current body of work was most recently shown at 31 Grand in Brooklyn to wide acclaim. Deanne Dunbar studied art at Alleghany College and the Vermont Studio Center. Dunbar's work seeks to subvery and challenge the male gaze. Also a writer Dunbar received the 2001 Ione Sandberg Schriber Prize in Creative Writing and the 2003 Pennsylvania Council of the Arts Individual Artist Fellowship for Fiction. Marchall Reese and Nora Ligorano have been collaborating on art projects with political and social themes since the 1980s. Their installation Free Speech Zone was on view at the Donnell Library Center in September, 2005 as well as at the Brooklyn Library in 2004. They received a Video Arts Fellowship from the NEA as well as the New York Foundation for the Arts. Their works are in major public collections including The Clark Institute, the Getty Center, and the New York Public Library. Hanneline Rogeberg has exhibited her work at the Aldrich Museum of Contemporary Art, at the Whitney Museum of American Art, and in a one-person exhibit at the Henie-Onstad Kunst Center in Norway. She received a WESTAF-NEA Fellwoship in 1996, and a Guggenehim Fellowship in 1999. Hanneline's work often includes licking unexpected places.